It’s 2001, and the Parkes Observatory—a towering radio telescope in Australia that’s over 70 feet across—just caught an unusual signal. It was both unusually energetic and unusually short—just milliseconds long. Lormier’s Burst, as it became known, spawned an endless supply of speculation on its origin. It took another five years before Lormier’s Burst was joined by another like it. Over the past 10 years, we’ve steadily continued to discover these mysterious radio bursts, each between 1-10 ms long. Fast Radio Bursts, they called them, or FRBs for short. Despite their growing ranks—now swollen to a rowdy sample of 16—their origins remained elusive. And still do. Among the vast army of ideas that have arisen regarding their origins, many envision the FRBs as the fireworks of an extravagant funeral show of sorts—leading to the death of the burster, owing to the fact that each of the FRBs have gone off just once. The high energy and short duration tell us that the source isn’t very large—no more than about 1000 miles, half the coast-to-coast distance of the US—encouraging theorists to explore various means of compact object destruction, such as the mergers or collapse of neutron stars and black holes (see Ashley’s post for more on one such idea). In addition, a burst arrives at different times based on what frequency you’re observing the FRB—at lower, less energetic frequencies, you observe the burst later. This delay at lower frequencies, quantified by the dispersion measure, is caused by free electrons between us and the sources of the FRBs, which slow the journey of the photons in the burst, and disproportionately so to those with the lowest energies. An FRB’s dispersion measure is larger than what the Milky Way could produce with its resident free electrons, suggesting they were created far outside our galactic home. And then. In May and June last year, the Parkes Observatory’s larger and thus more sensitive cousin, the Arecibo Observatory, picked up an eerily familiar signal: ten FRBs at roughly the same location in the sky as one that had been seen 3 years previous, now known as FRB 121102. Could these bursts have come from the same thing that produced the first? They measured the dispersion measure of each of the ten new bursts, and found that they were all about the same as FRB 121102’s—a strong indicator that they did come from a source the same distance away. It’s the first time we’ve captured a FRB going off again. Of course, this throws all our hypotheses that FRB 121102 and its subsequent bursts were produced by a catastrophic, death-ensuing event out the window. What then could it be? There are some clues in the bursts themselves. Some bursts are more energetic than others, and have different spectra (some bursts have more energetic photons, others have less). The timing of the bursts are also intriguing. They appear to occur randomly—the source seems to produce a bunch of bursts over several minutes, then lie silent for a time. 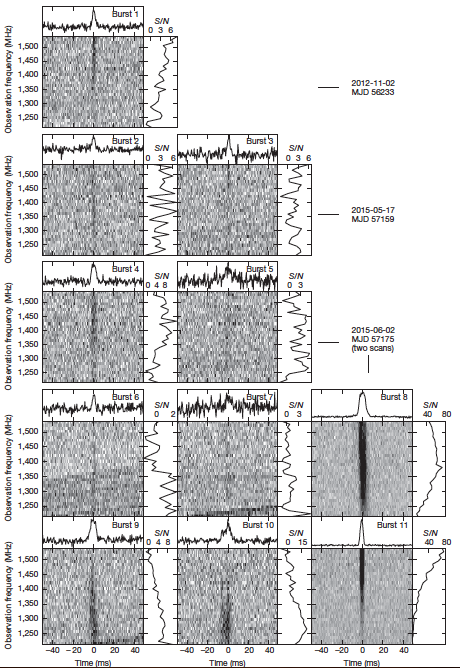 The authors weigh different non-catastrophic origins for the bursts: planets orbiting a pulsar with a magnetized wind? flares in the coronas of stars in the Milky Way? flares on exotic, highly magnetized neutron stars? Due to various difficulties with each of these hypotheses, the authors conclude that the most likely explanation are flares from a highly magnetized, spinning neutron star, much like the largest ones observed in the Crab pulsar. What of the other FRBs? It’s possible that this FRB may be different from the others that we’ve seen thus far—many of the others could be generated in cataclysmic events, as we previously believed. It’s about 10x less energetic than your typical FRB. It’s dispersion measure is lower than that of many other FRBs. And while other FRBs are high observed high above the plane of the galaxy, this FRB appears to be in the galactic plane (it’s dispersion measure is still large enough to indicate that it may lie outside the galaxy). Thus the search and speculation continues. This FRB will give astronomers much to chew on in the meantime. It’s an exciting time for FRB science! The 11 radio bursts seen by the authors of this paper. Bursts are shown chronologically, from top down. The squares show the spectra of a single burst over time (thus the 2D rendering). The burst is visible in the plots on top of each square, and the spectrum of each burst plotted to the left of each square (note that they look very different for each burst! ).